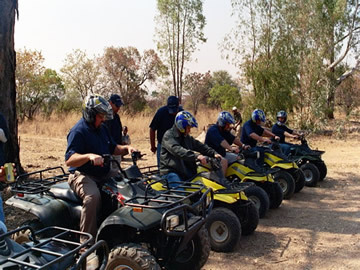 Quad Bikes are excellent when combined with other Drivng Activiities and Field Sports to make up a company Multi Activity Event- perfect for an Office Away Day! Why not add Archery or Clay Pigeon Shooting to your event? Quad biking in Bela Bela on Sondela Nature Reserve, great guided tour for your group. Our emphasis is on safety and enjoyment and we have qualified ATV instructors who will make sure both of these aspects are maintained.